Senior Gage Chiartano checks to see if he’s on the line, as him and the offense get set to attack against the Columbus Titans as Girard ended up prevailing 16-23, Friday. 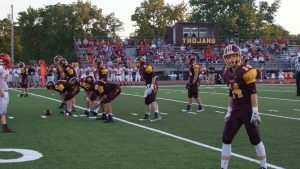 The Girard Trojans met up with the Columbus Titans Friday, September 14, at Frank Jameson in a CNC showdown. This game marked the inaugural first varsity football game on the new turf field. Girard came into the matchup coming off a loss to reigning CNC champions Galena. But the Trojans put on a show against Columbus. Girard’s defensive effort came up huge for the Trojans as there were four different players with an interception; Curran, Lallemand, Troike, and McReynolds. The Trojans put the first points up on the board in the second quarter as senior Evan Troike caught a long bomb pass from senior Ty Norris. This reception then led to senior Kreed Curran running it in making the score 7-0. Columbus then answered back on the next drive making a two-point conversion as they led the Trojans 8-7 at the half. In the third, Girard’s defense blocked a punt giving the team great field positioning. This then led to quarterback Ty Norris running it in the end-zone making the score 15-8. In the fourth quarter, both teams went back and forth. Columbus answered back later on in the fourth and converted their two points bringing their lead to 16-15 with a little over a minute left. But the Trojans came in the clutch when they needed it most as quarterback Ty Norris hit Evan Troike right in the hands for a touchdown putting the Trojans ahead 23-16 with 30 seconds left. Columbus then couldn’t get past the Girard defense as the Trojans went on to improve to 2-1 defeating Columbus 23-16. The Trojans next matchup will be Friday, September 21, at Burlington in a non-conference matchup.